Lamb dressed as Mutton: Using a wine bottle as a rolling pin... Oh yes! Hello Dear Bloggee (I'm so going with this). Just a quick one I'm afraid. Being a student, normally means you eat hundreds of ready meals (delicious, but horribly fattening) but being a keen baker/cook I won't let myself eat them. So I wanted to share with you my Caramelised red onion and goats cheese mini tartlets. They sound complicated, but I can assure you they are not. They go perfectly with a salad to keep things healthy or you can just have them as a starter. 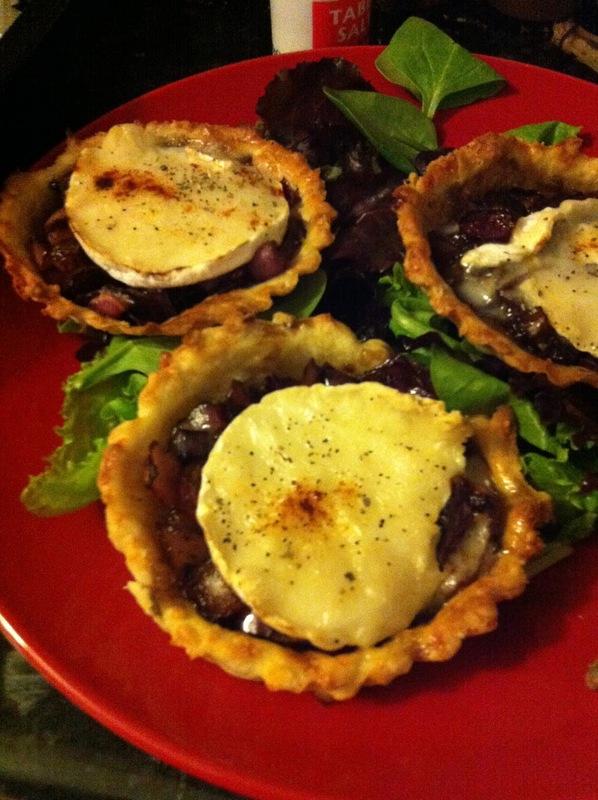 I got the recipe from Delia Smith Online: Caramelised Balsamic and Red Onion Tarts with Goats' Cheese. 1. First I made the pastry (I made half so that I only had four). It was so simple, just rubbing the butter and flour together and the cheese before adding the water. Don't worry if you accident;y add too much water, you can add more flour when you are rolling it out. 2. Then, once it has been refrigerated, you need to roll it out. I didn't have a rolling pin (they cost £10!) so I improvised with a bottle of wine (anything long and round will do). Once I had rolled it, as thin as I could, I cut out circles, just with a nice, about 1 centimetre bigger than the tartlet tin. I then put the pastry in the tin before pricking it with a fork. 4. Now for the filling. For 4 tartlets, I used 1 red onion. I chopped it finely and then put it in a pan with oil (butter is probably better). Once they have started to soften, add the balsamic vinegar. 5. Here is where I cheated. The onions with caramelise themselves over time, but I was in a rush, and overly hungry, so I added a little bit of caster sugar to give them that lovely sweet taste (about 2/3 tbsp). 6. Finally, all you need to do is add the onions to your tartlets, place a circle of goats cheese on top with a little sprinkling of cayenne pepper and sage (I used dried sage) if you have it, and then pop them in the oven for a about 10 minutes and Bob's your uncle (or great uncle in my case). 7. Once the goats cheese has begun to melt, they are ready to eat. Place them on a bead of salad and there you go. You have produced a very sophistacated meal with very little effort! Let me know if you decide to make them, and if you have any questions. Come back for bakewell tarts next time.